I found time to bake this week! I’m so happy! Life is better when you bake. 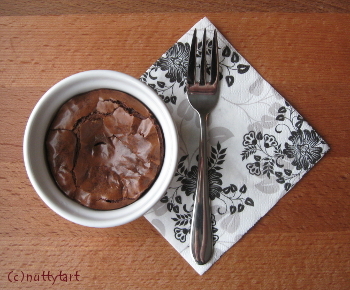 This is not a brownie-in-a-mug-in-a-microwave recipe. I have used those recipes, too, on occasion, when I’ve needed something sweet, toot sweet, but for me, the texture of microwaved mug goodies always leave a little something to be desired. Also, I like baking (you’re shocked, I can tell). I like the whole process of measuring and whisking and sieving and stirring, and then waiting for oven magic to turn batters and doughs into baked goods. So, into the oven these go! Preheat oven to 160 C. Lightly butter two ramekins (8cm in diameter). Combine all-purpose flour, cocoa powder, baking powder and salt in a small bowl. Place butter and chocolate in a small saucepan and melt over low-medium heat. Remove saucepan from heat and whisk in the sugar. Whisk in egg yolk and vanilla. Divide batter between the two ramekins. Bake for about 22 minutes. As always with brownies, do not overbake! The toothpick should come out pretty dirty. Allow to cool; top with whipped cream or ice cream if you prefer; dig in with a spoon or a fork. After dividing the batter between the ramekins, drop two teaspoons of peanut butter in the middle of each ramekin for a peanut butter brownie. Or add 1/4 teaspoon of cinnamon and a pinch of cayenne to the flour mixture to make a Mexican brownie. Lovely picture and a lovely concept too. I should take a leaf out of your book, but I find something very comforting in knowing that the cake / biscuit tin is full of something. Glad you managed to get some baking done and join in with this month’s We Should Cocoa – thank you. I’ve seen many a recipe for brownies for one, but this is the first for brownies for two. How lovely to have enough to share! Thanks for joining #WeShouldCocoa! The funny thing is that I started by making a selfish brownie for one! It turned out that I was never happy with the texture if there was no egg; a whole egg yolk/white wasn’t quite right, and I didn’t want to use “half of an egg yolk” – so doubled the recipe, used one whole yolk, and hey presto, two lovely brownies!